Try this dish with Better Than Bouillon Reduced Sodium or Organic Roasted Beef Base. In a bowl, season steak with desired amount of salt and pepper. In a hot skillet with 2 tablespoon of butter, sear both sides of the steak and cook 3 minutes per side or to desired temperate. When steak is done, remove from pan and set aside. Add the remaining butter and allow it to melt. Whisk in flour, Roasted Beef Base and water. Allow the gravy to thicken, and then remove from heat. 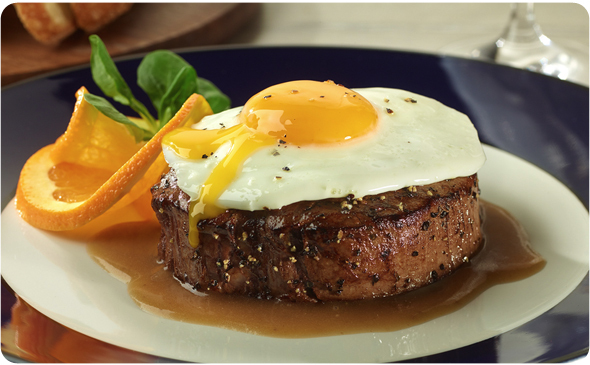 Top steak with the fried egg and drizzle gravy over egg and steak.